Following a psychotic break, Eli Carver finds himself on the run, behind the wheel of a car that’s not his own, in the company of a terrified woman he doesn’t know. As he slowly rebuilds his memories, layers of ugly truth are peeled back and dark secrets are revealed. Before long, the duo find themselves on the wrong side of Eli’s old criminal syndicate, in a struggle for survival against the most dangerous forces in their lives. They have to go back into the underbelly of humanity, laid bare and ready for the bullet or the knife. And all the way, Eli is haunted by the ghosts of people he’s killed in the past, haranguing him, a supernatural peanut gallery of mockery and hate. Manifest Recall follows Eli Carver’s downward spiral of psychosis, through the darker aspects of lost memories, human guilt, and the insurmountable quest for personal redemption. Out now from Grey Matter Press, wherever books are sold. 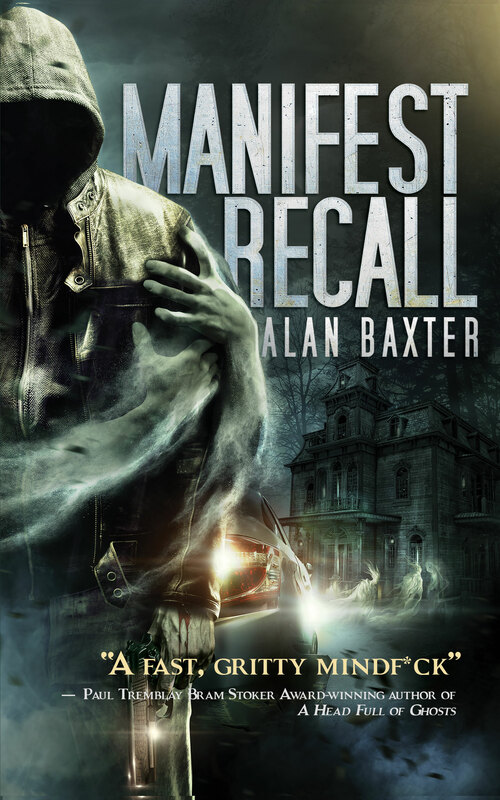 “Alan Baxter’s Manifest Recall grabs you by the scruff of the neck from word one and doesn’t let go. It’s fast paced, bad people doing bad things to other bad people. I gobbled it down in two nights. You should, too. Highly recommended!” – Bram Stoker Award-nominated author John F.D. Taff. “MANIFEST RECALL is a blood fueled bullet train roaring through the criminal underworld. A manic story of loss and revenge, MANIFEST RECALL starts at a sprint and never slows down.” – John C Foster, author of MISTER WHITE and THE ISLE.